I'm really into bits and pieces of the farmhouse/cottage style that's all the rage these days...especially the lighting. After swooning over so many gorgeous pendant lighting fixtures, I almost (ALMOST) bit the bullet with something I sort of liked in my price range. Then, I was at Target (aka the happiest place on Earth) and I saw this cute wire trashcan in the Dollar Spot section. It's entirely too small to be a functional trashcan, by the way, but it was perfect for an idea I had ruminating in my head. 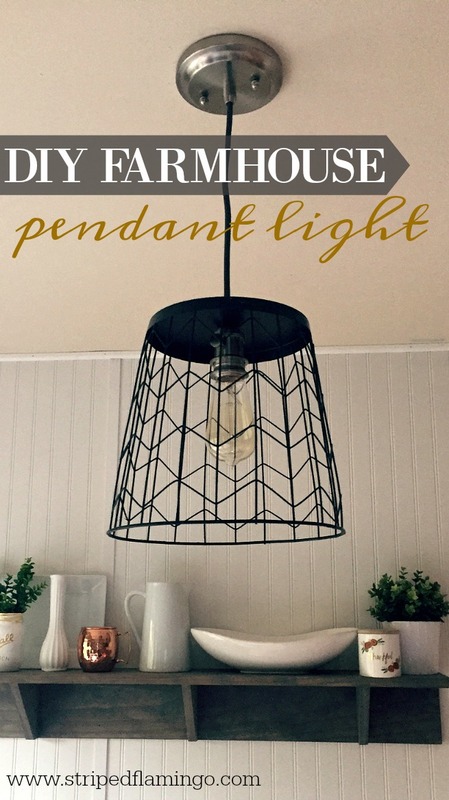 I really wanted to try and make my own farmhouse style pendant lighting to replace the bare Edison bulbs we had in the kitchen (peep from the end of this post). I love the light fixture, but it wasn't practical since a) anyone over 5'4" would hit their head on it and b) it was too large for that particular area. (We had the strands almost all the way up and they were still too long). So I asked M if he could help me. Now, let's be honest, I couldn't have done this project without M. I had the idea but he basically did most of the work. I'll try to explain the steps as simply as possible. Along with the trashcan we purchased a pendant lighting kit from Lowe's. We bought this one but you could swap for a less expensive one and this project would be even cheaper. First, M took some wire cutter things and removed the label/badge part and the handles from the basket. Then he measured and taped off to find the center of the bottom (where the light fixture would sit). He used a drill to make a hole in the center of the basket that was wide enough to push the pendant light fixture through but also small enough for it to be snug. After he got the light fixture situated, he sanded a bit around the hole (to remove the metal shavings) and then I spray painted it. I opted for a matte black since we have a ton of white in the kitchen and I wanted it to stand out. After it dried, M removed our old light and installed this one. Now, here's a note of caution. M went to school for electrical stuff so he knows what he's doing. Because I wanted this one to hang much higher than the other, he had to cut about 3 feet of wire and re-wire it a bit. Most people probably won't have this issue, especially if you have higher ceilings. Anywho, so once he got it installed I was absolutely thrilled! We put one of the Edison bulbs from the old fixture in there for now. But we'll probably replace with an LED bulb soon to get more light. It looks off-centered but that's just because of where I was taking the photo. I'm not the best at taking great interior photos...however I promise a better one when the light is better. Follow me on Insta to see a better photo later today. :) We were losing light as this project was wrapping up! I am obsessed with this pendant light. It's the perfect touch of farmhouse/cottage style and is high enough to not be a hazard for tall people. For less than $30 we got an awesome light fixture that was EXACTLY what I wanted! Really cute. Great job guys!